About 10 years ago I started a local website called forestgate.com (I still own the domain name and use it for email, though the site is long gone). Of all the emails I received about the site, by far the most common request was for information about an artist who once lived and worked in Forest Gate, L Kersh. Mr Kersh specialized in what he called “horological collages” – pictures made up from bits of clocks and watches, like the example above. These works have travelled far and wide and their owners were keen to know more about the artist and his work. I found your website on a link from Ebay while I was trying to find work done by Len Kersh. I am proud to say he was my Uncle, he was married to my Aunty Marion (my Mum’s Sister). I remember as a child going over to over to see them regularly at their house in Station Road, Epping, Essex, UK. I have fond memories of him and remember him being a lovely Uncle. His Wife now lives in Spain but stays in touch with My Mum on the phone & sometimes pops over to the UK to visit her. Just want to let you know that Len Kersh was my uncle and he passed away a few years ago. He had three daughters and I would love to have contact with them. I live in Sydney, Australia. Thanks to the internet I was able to find cousin Nigel and would love to find these other cousins. I actually met one of them at the factory in 1977. L (Len) Kersh of London was my grandfather’s nephew. Len’s father, Jack Kersh and my grandfather, Michael Kersh were brothers. They were born in Riga in Latvia, and emigrated to the United Kingdom (Sunderland in Jack’s case, and Glasgow, in my grandfather’s case), where they lived out the rest of their days. The story goes that Len was a “bit of a lad” in his youth, and got into all sorts of trouble. He eventually left home in Sunderland, and made his way to London. There he lost touch with his family, but made good by developing an idea with which he had helped a family member do a school project – the making of collages from old odds and ends. 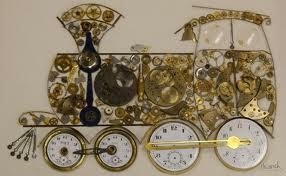 Ultimately this developed into his “horological collages” with which so many people are now familiar the world over. I only recently made contact with Jack Kersh’s side of the family as he and my grandfather apparently fell out over some matter, and never saw one another again. It was only by chance that the daughter of one of Len’s brothers, Bennie Kersh contacted me from Australia. I now have the missing pieces of our family tree, and it’s quite something. I don’t know what happened to Len, but I do know that his brother Charles is still alive and well and living in South Africa, where I am in contact with him through his son, also named Jack. I’ve asked him for further information about Len, but I’m not sure if he will have any further information beyond what I have described above. I do know that Len, Bennie and Charles had four sisters – Ethel, Elsie, Eva and Rose, and I’d love to know what became of them and of Len’s children, if he had any. I hope that fills in some of the missing information on my distant cousin. 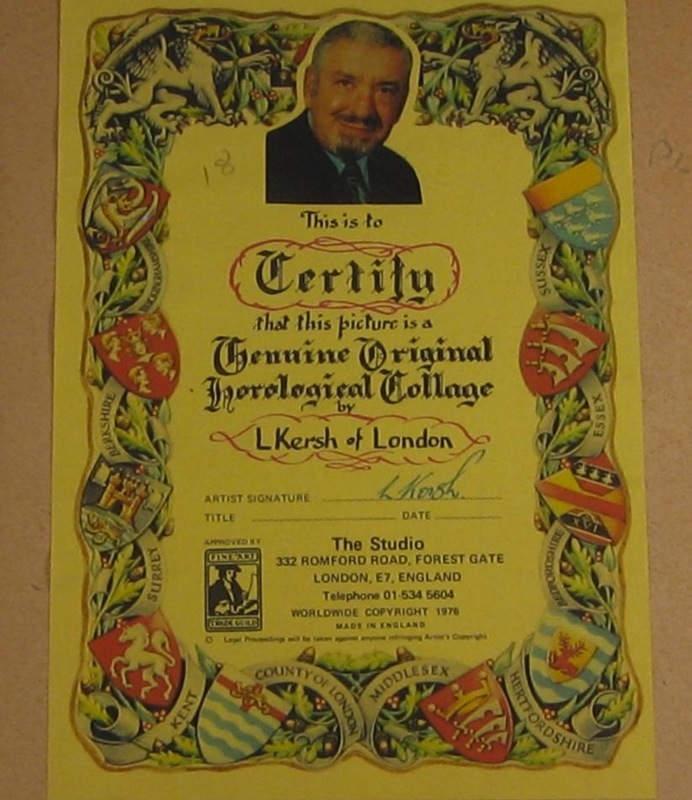 As can be seen from the certificate of authenticity that accompanied every piece he produced Kersh’s studio (or “factory” as his niece called it) was at 332 Romford Road. Sadly, there’s nothing now there to tell the world that this was where Kersh worked. Apparently it costs the US government 1.8 cents to make each 1 cent coin. Which is nuts, when you consider that a penny is pretty much worthless. I have no idea how much it costs our government to mint the 1p and 2p coins, but I wouldn’t mind betting it takes a loss on each one. Why do we still have copper coins? You can’t buy anything with them and they just fill your pockets up needlessly. It would be far better if we got rid of the 1p and 2p pieces and priced everything to the nearest 5p. No-one would miss them. And it wouldn’t necessarily put prices up, as I can’t see retailers moving their £9.99 price point up to £10 – they’d be more likely to go down to £9.95. New Zealand got rid of their coppers in the 1980s, and went so far as to abolish the 5 cent coin 5 years ago. They now make change with just a 10, 20 and 50 cent coin. It’s time we followed suit. So let’s make a change for the better and say goodbye to our copper coins.